HMI Copper Strip Vise-98V, used for sanding HMI-CS-U (or other manufactures), Copper Strips used with HMI’s 98C and 98B Corrosion Test Bomb, in accordance with ASTM Standards D 1838 and D 130 The 98V-SD vise is made entirely of Stainless Steel. The 98V-VB is also made of stainless steel except for the vacuum base which is cast aluminum. Both will swivel 360° horizontally and will clamp strips firmly in a flat, edge or end position. Adjustable for different thickness and widths of Copper Strips. 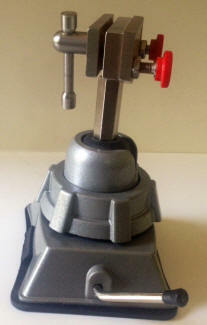 The 98V-SD Vise is supplied with mounting hardware. 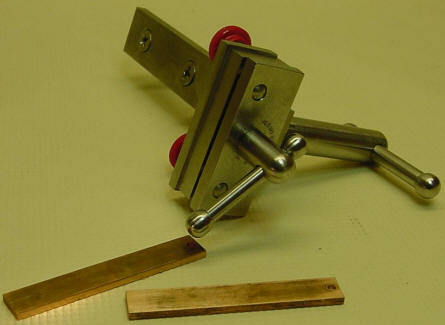 HMI Copper Strips available in pre-sanded, requiring only minimal polishing, and un-sanded.